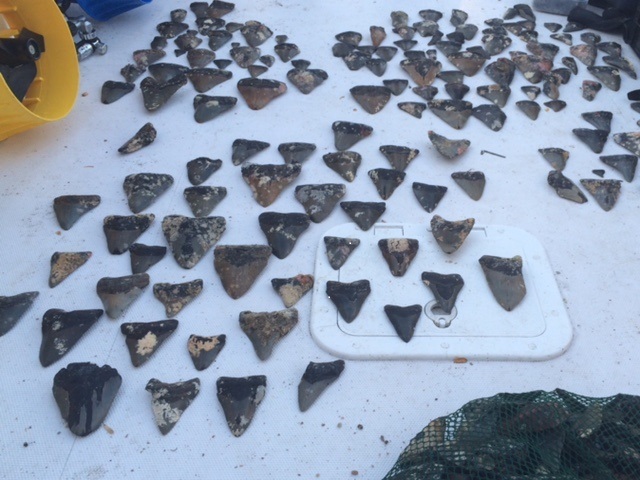 There are 2 main ledge systems where we recover prehistoric Megalodon Teeth. There is an inshore (26 miles) and Offshore (41 miles) site. These ledges are between 90 and 105ft deep. The Megalodon teeth are laying in the rubble patches just off the deep side of the ledge, where divers can dig for them, or just pick them up off the top. The crew at WB Diving is constantly searching for the best and most productive ledges to find teeth. We bring our divers to the very best spots, not the same rock over and over again.